Teaching Skills that Change Lives! We’re updating our swim lesson program soon to focus even more on keeping kids safe in and around the water. Our new swim lesson stages emphasize the true progression of swimming with a sense of achievement throughout the stages. This update allows us to keep doing what we’ve been doing great and build upon it to really make us better as the leading provider of aquatics in our community. What will the new lessons look like? We have come a long way since that first group lesson, and we’re excited to present the latest upgrades to you. 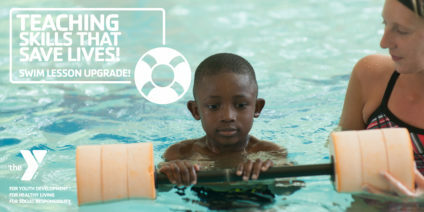 This curriculum was created by the YMCA of the USA to meet the needs of all Ys in communities nationwide and focuses on a core group of water skills that every person needs to be safe around water. These core skills naturally progress to competitive swim strokes. Students begin with and build upon skills they are ready to learn, helping them to celebrate their successes, build self-confidence, and enjoy learning to swim and water safety. Our new swim curriculum is based on extensive research, and we look forward to seeing swimmers advance more quickly through the stages. The fun fish names we previously used to identify the different levels have been replaced with names that more closely relate to the skills we will be working on, in each stage. Swim lessons are now organized into three phases, and each phase includes several stages focused on a specific skill set. Will my child still be using the progressive swim floats? No. The lessons will be taught without the progressive floats starting in the Fall of 2017. Your child will use other forms of flotations to use as a tool to help them learn. This will help your child to progress faster with their skills and will not leave them with a false sense of security while in the water. Won’t it be dangerous to have my child swim without their float? We are taking steps to continue to provide a safe and positive experience for your child. Our staff have already been going through many trainings to prepare for the transitions. You may have seen the staff take off the floats during certain parts of the class. We will also use teaching platforms in the water so that your child will be able to stand while in the pool. On top of this, we will be reducing the number of children in our beginner levels so that they will each have more individual time with the teacher. How can I help my child move smoothly through this transition? You, as a parent or caretaker, will have plenty of time this summer to be in the water with your child. You should start helping them swim without their floats on as you hold them or have them swim very short distances with you being within arm’s reach. They will then be ready and confident for their swimming lessons in the Fall! Just a reminder that you should always be in the water and within arm’s reach of your child if they are under the age of 7 or cannot touch the bottom of the pool with their head out of the water. What do the new lessons look like without the fish names? How will I know which level my child should be in? We will have more documentation around our YMCAs, on our website and in the program guides. Please visit the Welcome Center to pick up a swim level to stage conversion chart or see above. Feel free to speak with the Aquatics Director at any of the locations if you have any further questions. Please visit your branch Welcome Center to learn about free swim evaluation offerings. View Swim Level Class Offerings!